The recipe below only requires three ingredients, but you know what? You can put a touch of cinnamon if you want, it looks great. Try to use big, juicy tomatoes that are well red. Do not use tomatoes to make salad. Learn how to prepare a delicious tomato jam with only 3 ingredients and in less than 1 hour . Recipe type Dips, jams ...With this you will be able to remove the skin easily, do it. Once without skin Chop tomatoes into small cubes, including pulp and seeds. Put them in a saucepan with sugar and lemon and let them cook over low heat for 45 minutes. After this time the tomato should have a texture similar to jam. If you see that cooking is missing, let cook a few more minutes. A Once ready, let your tomato jam stand for a few minutes. Prepare m Tomato jam is really easy. You hardly need three ingredients and just under 1 hour of your time. I always recommend having at least 2 types of jams in the fridge: one red (strawberries, blackberries, tomatoes) and one yellow (apple, orange , peach). 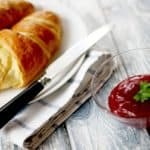 They are very useful, not only to spread bread and croissants, but also to use them as an easy filling for cakes/biscuits, as ingredients for salad dressings and for pork recipes, for example, to spread some chops with tomato jam and bake them in the oven. It is important to take into account that this recipe is not dietetic at all, it has a lot of sugar, it is a traditional jam. If you want to store it for a long time, you have to put the jam on a container of sterilized glass in a bain-marie. If you do not know how to do the bain-marie, in this video it is perfectly explained, I recommend you If you see it, it's very useful. Once opened, you can store it in the fridge so that it lasts a little longer. 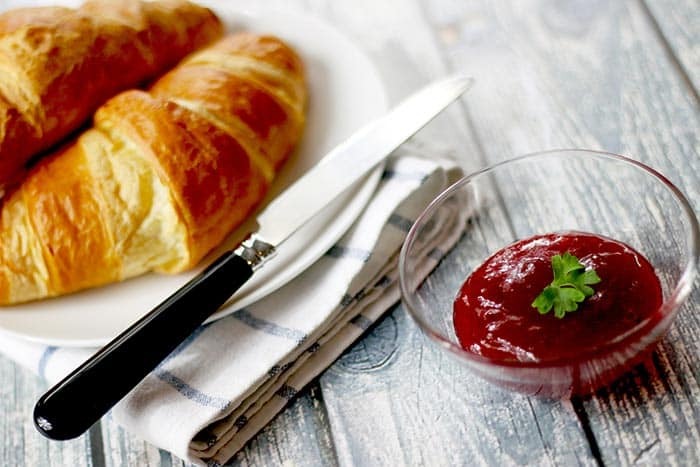 You can use this rich jam to accompany bread, as a filling for biscuits or for cooking.